Is it possible to run a viable society even as U.S. income inequality moves into altogether uncharted territory? The purpose of this talk is to show that, although the worriers are sometimes criticized as “Chicken Little” alarmists, in fact rising inequality has powerful effects on the amount of social mobility and opportunity in the United States. Because these effects are easy to describe and see, they could in principle provide support for a populist reaction against income inequality. 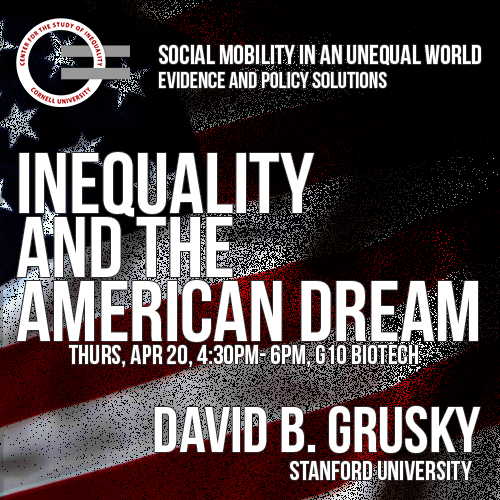 As part of the Center for the Study of Inequality's upcoming conference on Social Mobility in and Unequal World: Evidence and Policy Solutions, David Grusky (Barbara Kimball Browning Professor in the School of Humanities and Sciences; Director, Center on Poverty and Inequality, Stanford University) will give the opening keynote address on Inequality and the American Dream. This will take place on Thursday, April 20 in the Biotechnology Building in Room G10 at 4:30pm – 6:00pm. We have also planned a dinner for conference presenters and CSI affiliates in the Terrace Lounge of the Statler Hotel from 7-9pm. Space is limited – if you are interested in attending this dinner, RSVP with your name, contact information, and choice of vegetarian or meat option to inequality@cornell.edu by Friday, April 14.